I realize I’ve been neglecting my blogging duties, so I’m dropping in to share that I was quoted in the July issue of the Eugene Chamber of Commerce’s magazine! I talked about how much attending the Young Pro Summit for the last two years has helped me get settled and get inspired in my new home. Read the entire article (or magazine) online! Posted in Uncategorized on October 15, 2017 by Fatemeh Fakhraie. I recently moved to be closer to my job in Eugene. The summer was a hectic one, but I’m finally settled and looking to get comfy in my new town. In an effort to make a big new city feel smaller, I’ve been attending lots of networking events to meet people and learn new things. That’s difficult work to do as an introvert, but Lane county is such a friendly place that it’s already making a difference. I’ve been haunting the Eugene Chamber of Commerce a bit–in September, I attended their Women Business Leaders lunch to hear Celeste Edman from Lunar Logic talk about mentorship. She gave a fantastic talk, focusing on the fact that mentorship isn’t just about the person being mentored, and that you can have more than one mentor. Yesterday was a big day for me: I gave a lunchtime talk on content marketing for the Emerald Marketing Association! Content marketing is such a buzzword in the marketing industry, and so many still don’t know much about it, so I went over the basics, talked about a few must-haves to get started, and gave a few resources that have helped me in my content marketing education. The talk was a blast and the Q&A session lasted almost as long as my presentation! The audience was fantastic! Their questions were wonderful. I have to thank the EMA for such a welcoming and wonderful experience. And a huge thanks to Dave Bassett for photographing the event! It was an absolutely amazing experience, and I look forward to working with the EMA again sometime soon. EDIT: Check out the write-up of my presentation at the EMA blog! Posted in Articles + Talks, Extras on October 13, 2016 by Fatemeh Fakhraie. 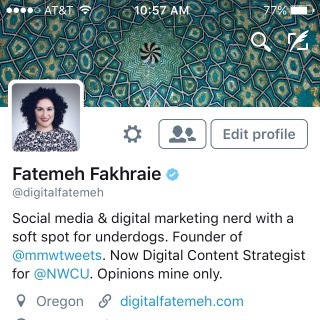 Twitter has crowned me with the blue check! I gotta say, it feels fantastic. Posted in Extras on September 12, 2016 by Fatemeh Fakhraie. It’s been awhile since I updated you on how things are going with me personally. Posted in Extras and tagged Northwest Community Credit Union, SXSW 2016 on October 19, 2015 by Fatemeh Fakhraie.